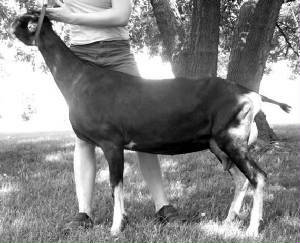 We admired Bum’s dam when she made her debut into the show ring & promptly earned her first leg! (Considering that the doe standing right behind her happened to be our “Hottie du Jour” who’d been shown extensively &, until then, was undefeated in her age class . . . you can bet Jamaica caught our attention! J) His breeder reports that his twin sister is developing into an extremely inspiring young lady, too presenting her with a precocious albeit very correct & pretty mammary, promising a bright future. Paternal sister, Willow Run Bugatti SolarEclipse , ADGA National 1st Senior Kid & National Reserve Junior Grand Champion, appraised EX90 as a 2 y.o., despite the mastitis damage that tragically ended her show career. The quality continues in her progeny, with a daughter being 2008 ADGA National 1st Senior Yearling. 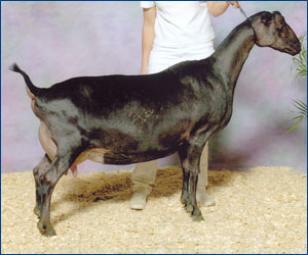 Paternal sister, Willow Run Bugatti Knicknack 2008 ADGA National 4th 3 y.o. Bum himself is a stretchy, angular & dairy guy who, once you look through the “gawky adolescence”, is a very correct fellow from nose to tail. Particularly admirable qualities he exhibits are his handsome, correct head; his high & wide escutcheon arch which harbors a very nicely shaped, snugly attached scrotum & proper teats; the nice, short pasterns & strong feet he’s standing on & his absolutely wonderful demeanor . . . traits we hope he’ll pass on to his future progeny here in our herd!